I have a dirty secret to share; I am a sufferer of chronic writer’s block. There are writers out there who claim writers block is BS and just get on with it – yay for them if they can, sometimes we make excuses not to write or just need a prompt to get into gear. However, for those of us who feel creativity is a living entity, blockages are very real, sitting trying to write, the lights are on but the characters aren’t home. I argue that each creative person should take notice of their own cycles of creativity; don’t flog a dead horse. My experience has revealed I have bursts of creative energy then the energy declines to a blockage. If I wait I’ll explode with creativity and the cycle continues its merry way. If I push my creativity during a blockage then the swing to a natural burst is delayed and usually the output is crappy. That being said, tarot cards are available to offer a helping hand against the dreaded writer’s block. I am a member of several writing groups. A few weeks back I had to write a 100 word flash fiction story. Of course I left it til the night before (and I’ll do the same this month and the month after) and drew a blank, short stories aren’t my forte, the whole starting from scratch thing. People get pissy if you bring nothing to share, that’s kind of the point to a writers’ group and I’d already used my get out of jail free card several times. Naughty, naughty. 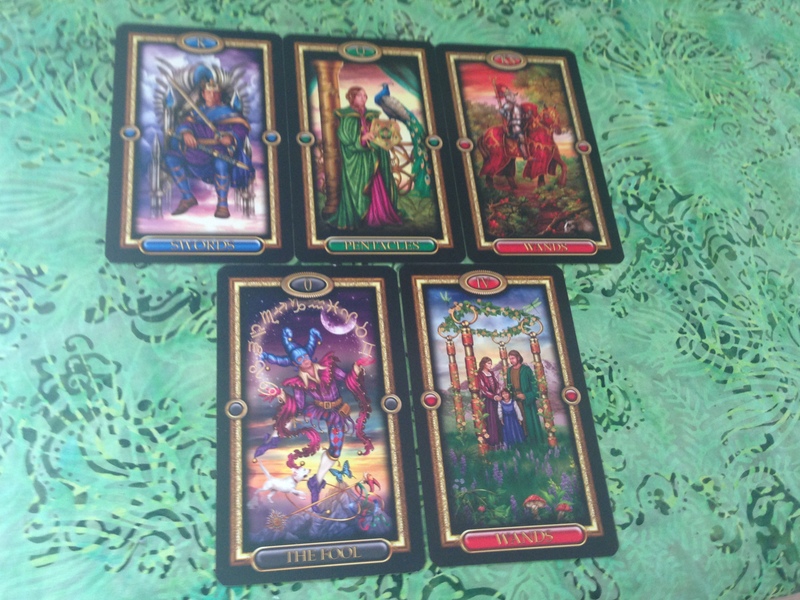 The key concepts I found in Corrine Kenner’s Tarot for Writers, but you could use any tarot book for key concepts or create your own by looking at the cards. Draw as many cards as you need to create a story, each story is unique in its needs. Bastardise card meanings to make them fit if the mood takes you, this isn’t a psychological/healing reading and the cards are free to be whatever. Below is the flash fiction I came up with in about five minutes. By no stretch of the imagination is this my best work; every writer knows we have hits and misses… and misses… and misses. However, the story does demonstrate one way the cards can be employed for storytelling. There lived a tyrant. He censored every aspect of his subjects lives; food consumed, games played, stories told and education. He demanded love and respect, oblivious to hypocrisy and psychological logic. When the fool found a hieroglyphic tablet that foretold the tyrant’s undoing, a child yet to come, all infants met a ghastly fate. A mysterious woman rode through the night, her cloak protecting her belly. The tyrant lived in bliss, til a hooded rider set fire to his hall and barred him in with glee. The pyromaniac, the queen, named her son her heir. The people celebrated.